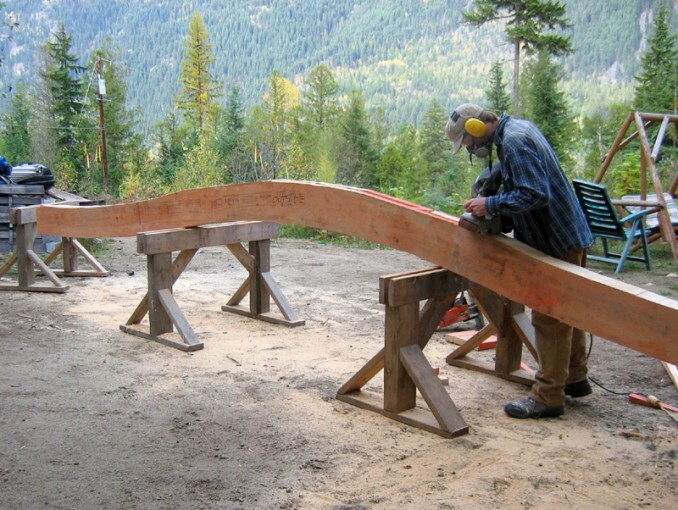 Two different radiuses were used to create the elegant arch for this curved deck roof beam. The centre of the beam was layed out with a 12′ radius, and the ends were layed out using a 32′ radius. The beam was cut with a chain saw inserted into a specially fabricated base plate to hold the chain square. We cut 1/8″ from the line with the chain saw and finished the beam precisely to the line with a belt sander. This photo shows the cut beam being sanded on saw horses outside the shop.